Clients can engage with us either prior to project implementation (an ex ante assessment) or after the project is operational and some amount of performance data have been collected (an ex post assessment). In either case, we will work with the client to identify the nature of the project(s) and determine what level of data are available for the assessment. We are able to work with as little or as much data as are available, recognizing that the more we know about the projects, the baselines, and the real-world performance, the more certain we will be of the resulting impact metrics. Climate impact quantification – A measure of the total expected GHG reductions over the lifetime of the project(s) being funded (metric tons of CO2-equivalent). GHG intensity of the investment – A measure of the intensity of GHG benefits for an investment based on dollars spent (metric tons of CO2e reduced per $1,000 invested). 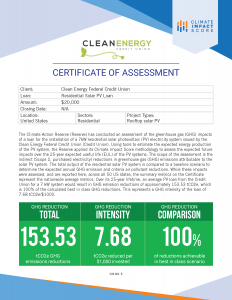 Best in class comparison – A measure of how well a project or portfolio compares to “best in class” projects in terms of achieving the greatest possible GHG emissions reductions. These metrics are communicated through a one-page Certificate of Assessment, as well as an in-depth report which discusses the investment, the project(s), the methods used, and additional detail around the resulting metrics. The comprehensive assessment is completed using a proprietary methodology developed for each specific project sector. The assessment includes a full report that provides a certificate of impact assessment, a summary of the project or portfolio of projects scored, an overview of the scoring methodology, details on the assessment numbers, and any additional relevant content. In developing its methodologies, the Reserve’s approach is to provide a rigorous standard against which to quantify the GHG impact of an investment over a project’s lifetime. The rigor, comprehensive nature, and transparency provide a greater level of confidence and assurance in the climate impact an investment is supporting. Below is a portion of a sample assessment for an investment that includes several small-scale energy efficiency projects. Contact us to learn more or get your project score.